What is the value of a Seminar for a Master’s in Education? You have finished your undergraduate work and you want to take courses that will help you master the discipline. Isn’t that the goal of your program? So why take a course in which people just sit around and discuss things? There are some definite advantages to seminars, especially for education graduate students, and for their instructors. Seminars, according to Wikipedia, are courses that feature intense study of one topic. Sometimes they are listed under different terms, such as “tutorial groups.” They include discussions but may also involve term papers, exams, oral presentations and other assignments. 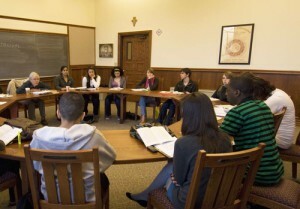 Classes are usually small so that students and faculty can interact more. The groups meet several times a week throughout the duration of the course. If you have enrolled in a seminar, you may wonder why they are required. Seminars usually involve upperclassmen, but some schools require freshman seminars. The purpose of these undergraduate groups is generally to build relationships between peers and students and their instructors. The subjects in these seminars are basically introductory issues and overviews of education. By the time you enter graduate school you are expected to have mastered the material and graduate seminars can help you in several ways. • The seminar leader is only a facilitator, not a teacher. That means students often lead the groups. The leader usually makes an oral presentation of the topic for discussion and then leads the discussion. This is excellent preparation for standing in front of a class to deliver educational material. • Seminars can be used to introduce other topics that are related to the course, and serve to help students transition to new ideas. • They explore subjects in depth. Seminars help students reach beyond the basics of a topic and get at the deeper implications and relationships involved in the area of study. • Seminars also expose students to new ideas and to the thoughts of people with different backgrounds. • Seminars teach vital skills for teachers and educational specialists like listening; negotiating; leadership; time management and dealing with conflict. • In graduate seminars, because the students have a certain expertise, new theories or methods in education can emerge. Knowledge is always evolving and seminar course teachers don’t necessarily know all there is to know about a subject. How do I Make the Best Use of my Seminars? Graduate seminars are fruitful exercises for all concerned. That is why universities require a Seminar for Master’s in Education degrees.